Now that I’ve shown you the exterior, kitchen and dining room, it’s time for the last stop of the tour of our fifth flip – the den and master bathroom! This little before and after is a bit of a mixed bag – the den pretty much stayed as it originally was but with a few tweaks, while the master bath was blown to smithereens then completely re-imagined. Not too bad, but there was definitely room for improvement. Since we were adding hardwoods throughout all the public areas of the house and wanted them all to flow seamlessly, the shiny engineered floors had to go. We also ditched the columns going into the kitchen and widened that opening for a more open feel (the door from the hallway to the den was also widened, just behind where this photo was taken). It’s a little hard to tell in the photo below, but we also removed the dated moldings from the cabinet doors (like we did here) as well as the scalloped trim on the bookcases. Oh, and the inside of the fire place got a new coat of black high-heat paint (like we did here). Finally, the whole room was brightened up with the addition of 9 recessed lights. 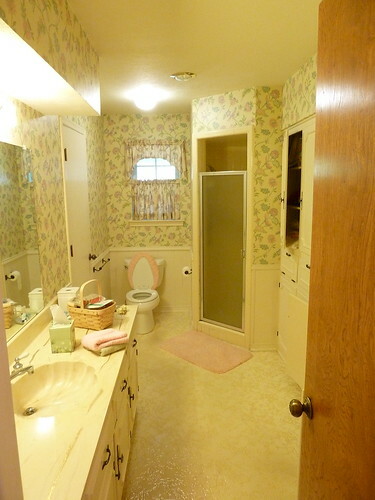 Ah, the master bathroom. I don’t know what was going on in the 70s but for some reason architects back then thought that every activity deserved its own room. Brushing your teeth? That would take place in the sink room. Taking a shower? That would take place in the wet room. Putting on makeup? That would take place, you guessed it, at the sit-down vanity in the dressing room. Bonkers. 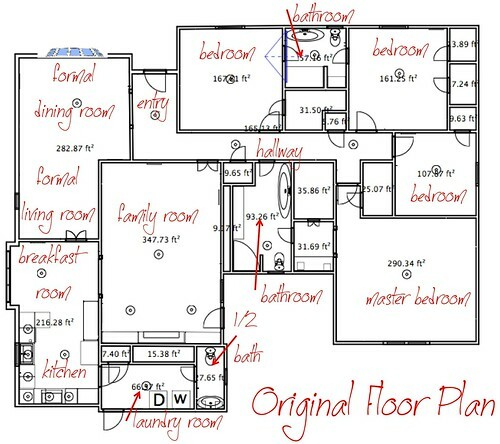 This house was no exception to that 70s rule – the master bath was divided up into 3 poorly used spaces that you can see in the original floorplan below (near the center of the house to the left of the master bedroom). Not a great use of space, so we started over, and added a half bath accessed through the hallway while we were at it. After all the sawdust settled, this is how the master bath turned out. “After” photos courtesy of Shoot 2 Sell. I love the den–only a few changes made to look so much better. Of course the bathroom is like night and day. AMAZING! It’s funny, I hardly noticed the celiling in the family room in the before photos – those recessed lights really show it off beautifully. And that master bathroom! WOW. Wonderful job! That shower is HUGE! And I love the details in the finished main room–not too many, but just enough. So glad you kept the trim on the walls! Totally WOW! The bathroom is fabulous! Love the brightness the canned lights brought to the beautiful den. looks amazing. great job in both areas! 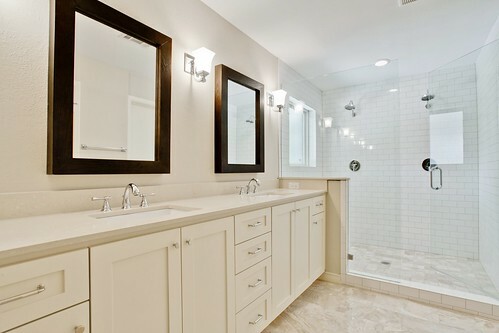 I absolutely love that master bath. 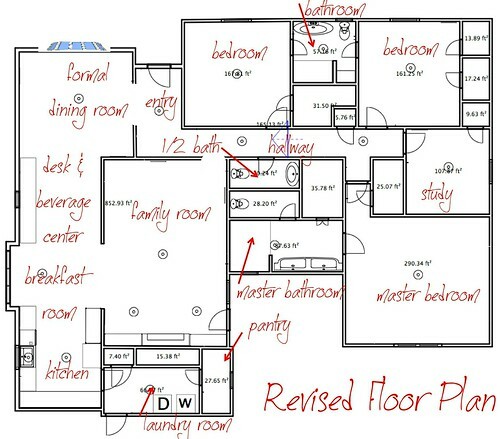 We’re getting quotes to add a master bath & closet upstairs and a mudroom/entry/powder room downstairs. I’d love to get something like that into our house! That bathroom is amazing, really good job on the whole remodel. Love the way the bathroom looks! The bathroom came out amazing, and is that 2 shower heads in the shower? 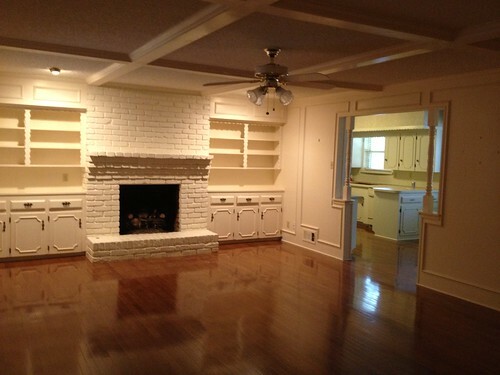 Awesome remodeling flip. Great job! Fabulous job. Master bath looks awesome :). Efficient use of space..so inspiring and innovative. I am loving your work. 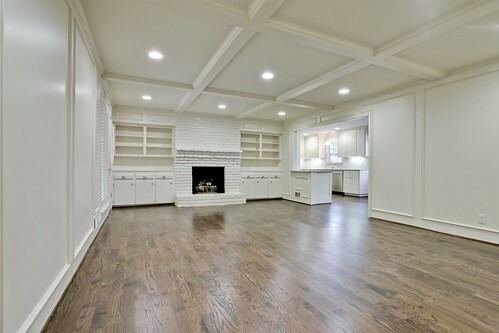 Such a great use of space and lighting, wonderful transformation.